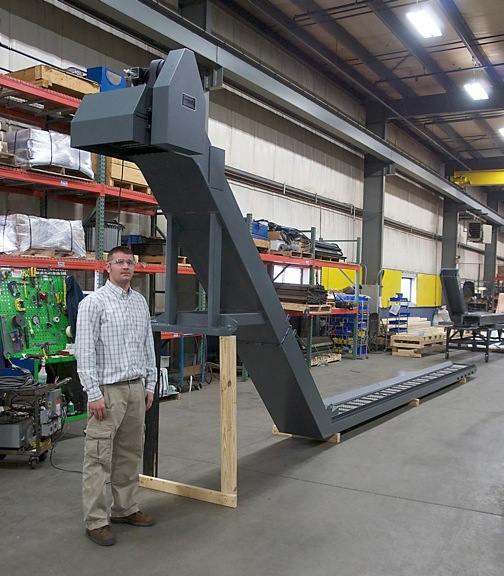 Whether the application involves producing/removing chips or moving parts/scrap pieces, Hennig can provide the chip conveyor for all machine tool requirements. The company’s new 2-1/2” pitch steel belt can be made for most applications in the field when the standard 1-1/2” pitch belt is not effective for the particular conditions present. 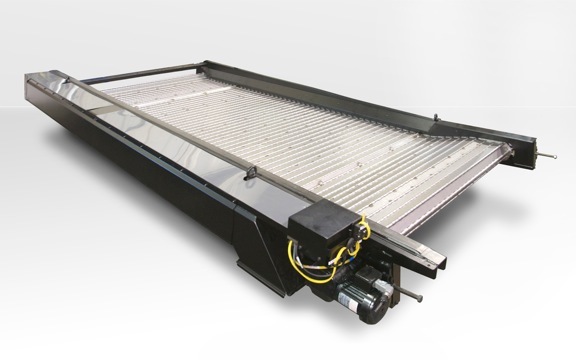 Conveyors from Hennig, a leading supplier of chip conveyors to the global machine tool market, can be manufactured in widths from 4” to 80”, depending on the need. The unique Hennig belt hinge is designed as one continuous piece, whereas many competitive brands do not have this feature. The manufacturing of these belts is done on Hennig’s in-house press equipment. 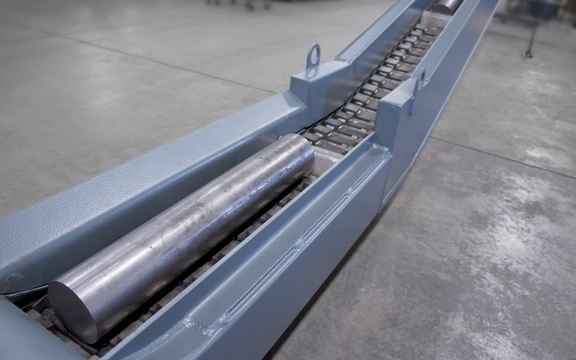 Hennig recognizes the special requirements needed when designing a parts conveyor on which direct loads contact the belt. 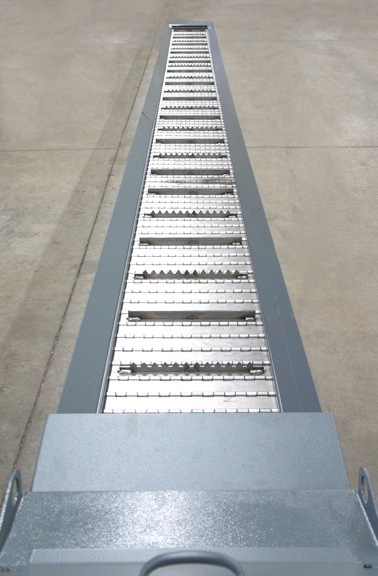 Impact plates are just one of the many options to be considered when customizing a conveyor for these applications. Chip volumes can also vary between applications, so speeds and sizes are always evaluated by Hennig’s engineers. Special incline covers (top hat design) can be included when larger amounts of stringy/balled chips are to be evacuated from the machine. 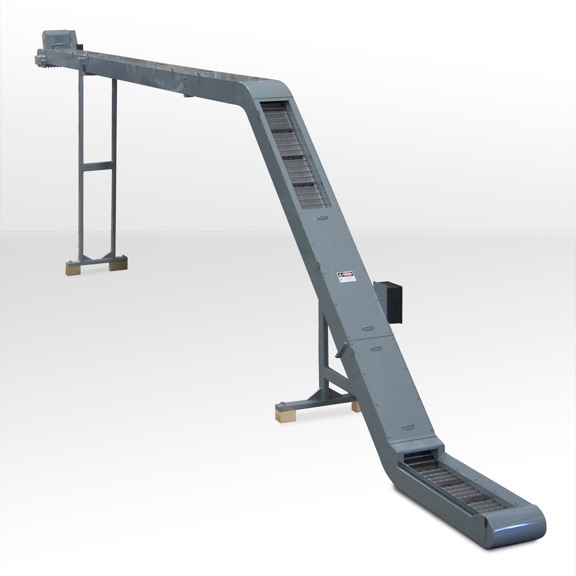 As adjunct to this new 2-1/2” pitch steel belt conveyor, Hennig also offers complete filtration systems, as needed. The company’s Chip Disc Filtration (CDF) systems can also be used with the new 2-1/2” pitch conveyor. These systems can filter down to 25 microns and additional bag filters can be included to achieve the through-spindle requirements on most machine applications. Whether the need involves moving chips into a hopper, evacuating larger volumes of chips through a plant wall into a truck/dumpster or hauling scrap parts from the machine, Hennig can assist machine builders and end users alike with any specific requirements. Innovations and new developments in machine tool design present myriad opportunities for the engineers at Hennig (www.hennigworldwide.com), who have been designing and producing custom machine protection and chip/coolant management products for state-of-the-art machine tools for over 50 years. Hennig products are designed to protect against corrosion, debris and common workplace contaminants. Hennig has manufacturing facilities in the U.S., Germany, Czech Republic, France, Brazil, India, Japan, China and South Korea. Its North American repair centers are located in Machesney Park, Ill.; Chandler, Okla.; Livonia, Mich.; Blue Ash, Ohio; Mexico City, Mexico; and Saltillo, Mexico.